Laila Sell discovered her passion for yoga in 1998 and has been studying it ever since, researching and exploring the yogic way of life. A journey of finding balance between movement and stillness, stability and fluidity, being and doing. Laila’s journey brought her to spend over 8 years of her life in India where she was fortunate to develop her teaching and own experience and education under an Indian master in the Iyengar Yoga tradition for 4 years. Since then she has continued to study different forms of Yoga with many great teachers from various backgrounds ( Yin, Restorative, Scaravelli inspired yoga ,Yoga Synergy, Calligraphy yoga and Vipassana meditation) as well as being self-taught and explorative in her own daily practice. She is also qualified in various bodyworks and healing techniques as well as a trained dancer. 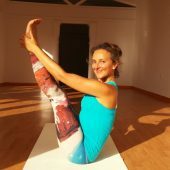 Since 2006 Laila has been teaching Yoga full time around the world between India, Morocco, Malta, Turkey, Germany, Uk and Italy. Yang practice: The class is rhythmic and internally warming the body. You will learn to develop balance, strength and flexibility as well as connecting body, breath and mind. Emphasis will be placed on moving safely and harmoniously while paying attention to alignment and grounding. The pace is flowing and slow in order to cultivate meditative awareness. No matter if you are a complete beginner or a more experienced yoga practitioner, you will find something new to learn. All levels are welcome as I show different variations to the postures so that you can adapt them to your personal needs. Yin practice: In Class tools will be given to find deep relaxation to rejuvenate your nervous system through restorative asanas using props as well as long-held yin poses that effect the meridians. These classes are an invitation to rest, relax and open through physical, energetic, emotional and mental layers. Yin sessions sessions enhance calm, clarity and well-being, improve sleep, digestion and general balance. These classes end with Meditation practices based on Vipassana, Mindfullness and Yoga Nidra. I teach simple techniques, yet of profound effects, attention to the breath, sounds, feelings, visual and body scans to reconnect with yourself deeply.